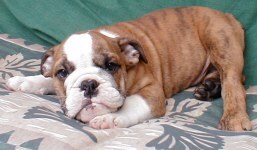 I first fell in love with Bulldogs, when we received a 4 month old bulldog, from a local breeder, which had a slightly crooked front leg. Once we got our baby home we immediately took it to my veterinarian to be checked. It turned out that our baby was perfectly healthy except the right front leg was slightly more bowed than the other leg, my veterinarian suggested that we try a splint for awhile. Within 2 months our baby had out grown the crooked leg and was running jumping and playing like nothing had ever been wrong. The bulldog immediately took the run of the house and access to the bed, and my favorite Lazy Boy recliner. We fell in love with the breed and have been in love ever since. 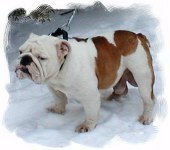 I then started researching the breed, and took extreme care in purchasing our bulldogs. Our bulldogs come from all over the United States, we have dogs from Oklahoma, Tennessee, and our Walker is a Minnesota Native. 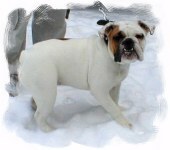 We not only looked at getting champion bloodlines for quality looks and breed standards, but also healthy bulldogs. I personally feel that health is the most important feature your bully can have. We strive to have the healthiest puppies possible. We do not raise a lot of litters per year. We do strive for quality more than quantity, and also have our dogs in our home as part of the family. We strive to produce healthy, social bullies with great temperament, to make loving companions, and wonderful additions to any family, by giving them the best start possible right in our own home, with proper veterinary care, and the necessary attention needed to produce puppies we can be proud of. All our full registration puppies do come with a Health Guarantee. Bobbi's Baby Doll, she is truly a lover, and very active. Her favorite pastime is playing fetch, wading in the lake, and napping on the sofa. She is a white and light fawn piebald female. Jeanie, she is our leader of the pack. She is very independent, but social, and being the oldest, plays the roll of "mother hen". Her favorite pastime is napping on the bed, or sofa. She is a medium fawn and white female with a slight black mask over one eye, and fawn marbling on her back. Lil' Brittany Ann, is our baby ( and just as spoiled as any baby). She is truly our little princes, and she knows it. Her favorite pastimes are sitting on my lap, napping on the sofa, and being pampered. 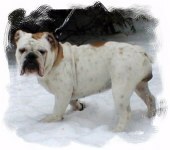 She also likes to "strut her stuff" and is our most "vocal" bulldog. She is mostly white with medium fawn and black patch over one eye and fawn spot on her back. Walker, he is our little bully boy. Walker is 3 yrs. old and 40 lb stud, short stocky and wrinkled with very heavy lips, and lovely large rope over his nose. He is white with dark fawn/red marbling. This male is so sweet, he just loves to be "loved" and lounges most of the day. 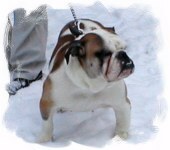 Walker has all the bully bulk in a nice compact size He is an AKC Stud. See Stud Service page for Walker information. Tigger, is our up and coming stud to be, we will be adding new pics, as he grows.